On December 17, 2003, America stood poised to see a reproduction of the Wright Brothers’ flying machine lift from Kill Devil Hill near Kitty Hawk, North Carolina. It was in commemoration of one hundred years of flight, 1903-2003. The replica, however, with all the attention to details, did not fly as well as the Wright Brothers’ plane, and the 100 year celebration hit an unexpected snag. One Micajah Clark Dyer, an inventor who lived and worked in the Choestoe District of Union County, made a flying machine that pre-dated that of the Wright brothers by fifteen years or more. The reason we do not hear more about this amazing feat of a mountain genius is that he did not secure a patent for his machine and he died before he could perfect it and get the publicity necessary for making his invention a part of flight history. Micajah Clark Dyer was born in South Carolina on July 23, 1822. His mother was Sallie Dyer (b. about 1804 in SC), eldest daughter of Elisha Dyer, Jr. (b. about 1785, d. 1847) and Elizabeth Clark Dyer (b. about 1783, d. 1861). When Sallie Dyer was about eighteen, she gave birth to Micajah Clark Dyer out of wedlock. It has been a matter of family legend that the baby’s father was one John Meyers, but he did not ever marry Sallie nor claim his son. The baby, Micajah Clark Dyer, was named after Sallie’s grandfather, Micajah Clark, her mother Elizabeth’s father. Elisha, Jr. and Elizabeth Clark Dyer raised Sallie’s son as their own. They did, however, confuse the record a bit, because they had already named their eighth child, a son, born in 1817, Micajah Clark Dyer. 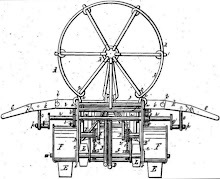 Some have surmised that the inventor Micajah Clark Dyer’s father, John Meyers, must have been very mechanical-minded, because Micajah Clark early on showed propensities toward inventiveness. The 1822 Micajah Clark Dyer moved to Union County, Georgia with his Grandfather Elisha Dyer, Jr.’s large family and they settled in the Cane Creek section of Choestoe District. The family was in Union County when the first county census was made in 1834, two years after the county’s founding. Micajah Clark’s mother, Sallie, married Eli Townsend and they had a family. However, it is believed that Micajah Clark continued to live in the household of his grandfather Elisha Dyer, Jr. and did not grow up with his half-siblings which included Andrew, Elisha, Thomas, Polly Ann, William and Sarah Elizabeth Townsend. Micajah Clark Dyer was introspective by nature. His education in the one-room teacher school for a few months of each year was supplemented by his own innate ability to “figure out” things for himself. On July 23, 1842, when he was twenty, he married Morena Elizabeth Ownbey (1819-1892). To them were born nine children: Jasper Washington Dyer (1843-1913 who married Emaline E. Lance); (Rev.) John M. Dyer (1847-? who married Elizabeth Ann Sullivan); Andrew Henderson Dyer (1848-1903 who married Adeline Sullivan); Marcus Lafayette Dyer (1850-1921 who married Clarissa Wimpey); Cynthia C. (1852-1917 who married John P. Smith); Mancil Pruitt Dyer (1854-1916 who married  Rebecca Jarrard and  Margaret M. Twiggs); Robert F. Dyer (1856-? who married Elizabeth Fortenberry); Morena Elizabeth Dyer (1859-1903 who married James A. Wimpey); and Johnson B. Dyer (1861-1885 who married Mary Hunter. Many descendants of Micajah Clark and Morena Ownbey Dyer still reside in Union County, Georgia. Morena Dyer had the convenience of running water in their home at Choestoe, as Clark devised his own water system consisting of hollowed-out logs run from the bold spring on the mountain to their house. When he was not busy with cultivating the land on his farm and tilling the crops necessary to the economy of his large family, Clark Dyer labored in his workshop. There, he experimented with a flying machine made of lightweight cured river canes and covered with cloth. Drawings on the flyleaves of the family Bible, now in the possession of one of Clark’s great, great grandsons, show how he thought out the engineering technicalities of motion and counter-motion by a series of rotational whirli-gigs. He built a ramp on the side of the mountain and succeeded in getting his flying machine airborne for a short time. Evidently, to hide his contraption from curious eyes and to keep his invention a secret from those who would think him strange and wasting time from necessary farm work, Clark Dyer kept his machine stored behind lock and key in his barn. Those who would not ridicule the inventor were allowed to see the fabulous machine. Among them were several who bore testimony to seeing the plane; namely his grandson, Johnny Wimpey, son of Morena and James A. Wimpey; Herschel A. Dyer, son of Bluford Elisha and Sarah Evaline Souther Dyer; and James Washington Lance, son of the Rev. John H. and Caroline Turner Lance. Just when the fabulous trial flights (more than one) occurred on the mountainside in Choestoe is uncertain, but it certainly happened before Clark Dyer’s untimely death on January 26, 1891 when he was 68 years of age. Prior to his death, he had invented a “perpetual motion” machine. Mr. Virgil Waldroup, a justice of the peace and merchant in the area, had helped Clark Dyer to “send off” to Washington for a patent on his inventions, but these were not forthcoming before Dyer’s death. It is also a part of family tradition that his son, Mancil Pruitt Dyer, turned down an offer of $30,000 for the patent purchase of the perpetual motion machine, evidently thinking that if he held out for more money he could receive it. 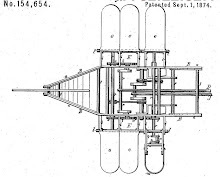 And still another family story holds that Clark’s widow, Morena Ownbey Dyer, sold the flying machine and its design to the Redwine Brothers of Atlanta, who, in turn, sold the ideas to the Wright Brothers of North Carolina. The facts of the fabulous flying machine of Choestoe are lost in Mountain Mists and family legends. But it is a known fact that one inventor named Micajah Clark Dyer watched the birds fly and asked, “Why not man?” and proceeded to act on his dream to invent a machine that would defy gravity. It actually got off the ground in the late 1880's. Pine Top around 1890 might have been the Kitty Hawk of 1903 had times and circumstances been more conducive.